Thank god the 90’s are over – no more bare midriffs, belly button piercings or celtic sun tattoos around the navel. Fashion-wise, we’ve come a long way in the new millenium – or so I thought. 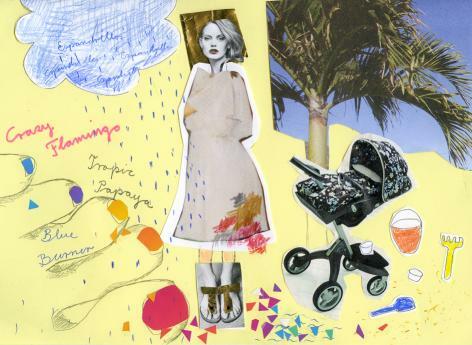 To say the least, I was mildly disenchanted while looking at 2011’s summer trends and trying to apply them to the trials and tribulations of motherhood. “Espadrilles are back!” revealed Annika Zieske, our very own fashion expert. But for a mother who needs to run errands at least twice a day with a kid, stroller and/or bicycle, espadrilles are probably the most impractical footwear imagineable. When Berlin’s skies started to darken and early June turned into early November for a couple of days, showers of rain took me by surprise on the way to kindergarden, from the supermarket and at the park. All my super stylish marine blue espadrilles could do was remind me of a tampon floating in a water basin. And if that wasn’t reason enough to expell cotton slippers from temperate climate zones, there’s even room for (downward) improvement. Berlin’s shoe stores have been joyfully advertising “XL-Maxi-Wedges” – in other words, Espadrilles with wedge heels. Unfortunately, as is the case with many other mothers I know, heels have just sort of disappeared from my closet since the birth of my son – albeit to my boyfriend’s dismay. Either way, I recommend “Gizeh habana” or “Ramses stone” to those mamas who know what I’m talking about. Which brings me to this summer’s next no go for moms: Tropical toenails. After repeatedly postponing a trip to the pedicurist (baby’s fever, etc, etc) I used a childless afternoon to check out Douglas‘ nail section. I was ready to do something crazy: spend heaps of money on make-up. My pulse was racing as I placed “Crazy Flamingo”, “Tropic Papaya” and “Blue Burner” nailpolishes into my shopping bag. Three days later, after a trip to the petting zoo, an afternoon of building sand castles and three hours at the soccer field, my feet were entirely robbed of their glamour and had returned to their pre-manicural state. Next PostHaustiere für Kinder: Dann eben ein Fisch!